Today you can find the Musée du Vin installed in the old vaulted cellars below the 14th century Abbey of Passy and also below Honoré de Balzac’s house. The ceiling even contains a trap door that he used to escape from his creditors! Musee du Vin, Paris, France, 16th Arr. 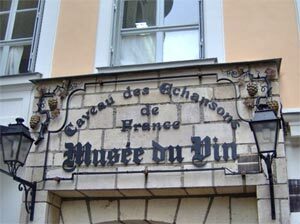 Located in the 16th arrondissement of Paris near the Eiffel Tower, this museum is a must for all who enjoy wine and would like to know more about how it is made and the tremendous variety of different types of wine from different wine regions. Today, these cellars that house the Musée du Vin, exhibit old bottles, vats, instruments, objects and tools that all relate to viticulture and wine producing in ancient times. The exhibits appear to have everything possible connected with wine… from corkscrews to decanters, glasses to barrels, wine presses and so much more; And a section showing old photographs, articles, portraits, and drinking songs. There is even a hymn to Saint Vincent on display, and he is one of the main Patron Saints of wine! By indulging yourself in a tasting class with the aim of providing amateurs with a better understanding of different wines, you will end up knowing what to pick and what not to, to accompany your food choices. And although most of the tasting sessions are in French, it is also possible to book English wine tasting sessions as well. There is also a restaurant that is situated in the cellars that has a fantastically cosy atmosphere and there are different menus to choose from, all with traditional food. Also upon request there is an option of having a wine tasting session of the famous Grand Cru wines and talks by the experts. Guide books in different languages are available for purchase from the museum. Open from a Tuesday through Sunday from 10am to 6pm. Closed on Mondays and on bank holidays.